Excellent Disinfectant Cleaners, Concentrates, & Sanitizers for use in hospitals, health care settings, child care centers, day care centers, clinics, schools, Pre-Schools, k-12's. etc Name Brands like Lysol Disinfectant, Clorox Anywhere Spray Sanitizer, Disinfectant Wipes, Victoria Bay, Simoniz Professional Products, etc. 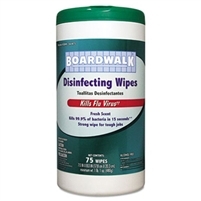 Convenient cleaning wipes that disinfect hard surfaces on one easy step. Bleach- and alcohol-free formula kills 99.9% of E.coli, Salmonella, Staph and Strep. Also effective against Influenza A and H1N1 flu virus. Ready-to-use, premoistened wipes are great for offices, hospitals, clinics, day care centers, restaurants, Child Care centers, schools and nursing homes. Easy dispensing canister. Includes 6 canisters of 75 disinfectant wipes each. Includes 8 trigger spray bottles of cleaner. A RTU (Ready to Use) quaternary-based nonacid cleaner and disinfectant for nonporous, inanimate surfaces such as walls, stove tops, tables, shower stalls, bathroom tile, toilet bowls, counter tops, sinks, etc. Effective against Mycobacterium tuberculosis (BCG), Staphylococcus aureus, Salmonella choleraesuis, Pseudomonas aeruginosa, Methicillian resistant staphylococcus aureus (MRSA), Vancomycin resistant staphlococcus aureus (VRSA), Vancomycin resistant enterococcus faecalis (VRE), Canine Parvovirus and Poliovirus Type 1 and meets the requirements for hospital use. KILLS HIV-1 ON PRE-CLEANED ENVIRONMENTAL SURFACES/ OBJECTS PREVIOUSLY SOILED WITH BLOOD/BODY FLUIDS. It is fungicidal against the pathogenic fungi, Trichophyton mentarophytes (Athlete's Foot Fungus).